Do you sometimes indulge in chocolate and feel guilty immediately afterwards? Now you can rest easy after consuming a few pieces of chocolate occasionally, especially dark chocolate. 1) Lowers risk of heart disease and stroke Although we have been taught that saturated fats may negatively impact the cardiovascular system, saturated fat from the cocoa bean does not raise blood cholesterol like other saturated fatty acids. The intestinal tract has a hard time absorbing fat from cocoa butter and its effect on cholesterol has been considered “neutral.” According to an article in the Journal of Cardiology Research and Practice, a European study revealed that eating chocolate may lower blood pressure and the risk of cardiovascular disease. Conducted over eight years, the study urund that consuming 7.5 grams of chocolate daily reduces the risk of myocardial infarction by 27 per cent and lowers the risk of stroke by 48 per cent. 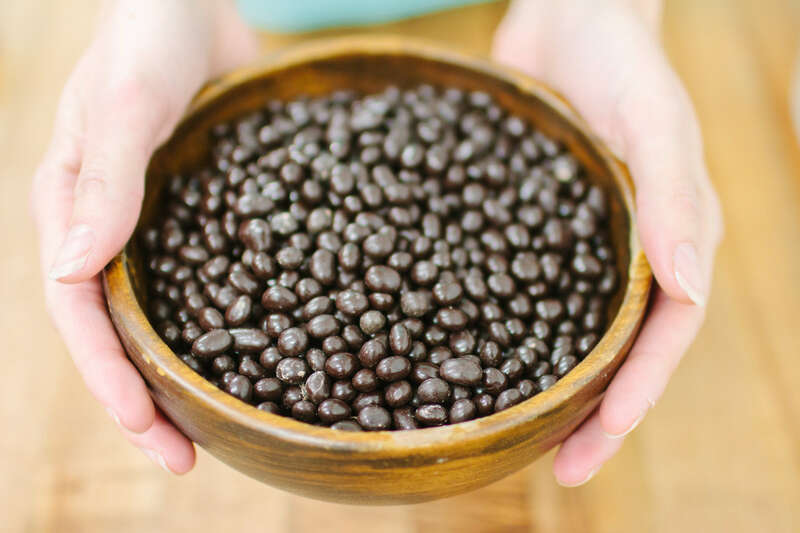 2) Excellent source of flavonoids and antioxidants Cocoa contains some of the highest amounts of flavonoids known to us, which are a special class of plant nutrients that help protect plants from environmental toxins and help repair damage. The cocoa bean is rich in flavonoids and gives us an ‘antioxidant power’ when we consume it. 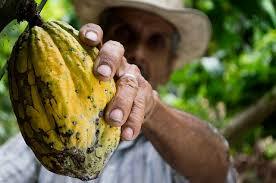 Contemporary Reviews in Cardivascular Medicine suggests that consuming cocoa boosts antioxidant capacity in the plasma. Teas, grape juice, wine and berries are other foods that contain high amounts of flavonoids. 3) Mood-enhancer Chocolate consumption has been found to release feel good brain chemicals and encourage a positive shift in mood. A study in 2013 revealed antidepressant effect in rats that consumed high flavanol cocoa extract in a forced swimming test. Another study indicated that by three days of a group of test subjects consuming chocolate, mood was found to significantly improved. Mood enhancing factors included a decline in fatigue and increased energy. 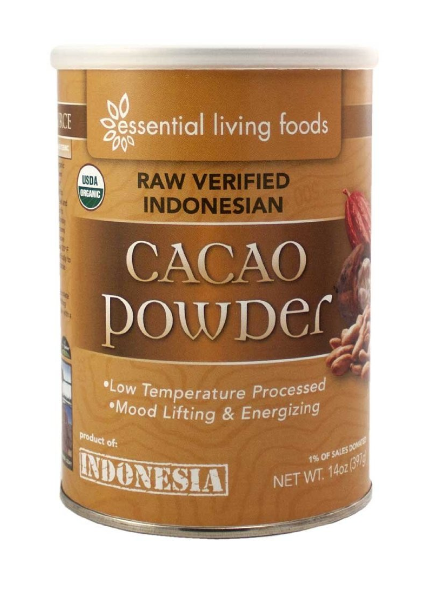 4) Anti-inflammatory Cocoa has been found to possess anti-inflammatory properties. 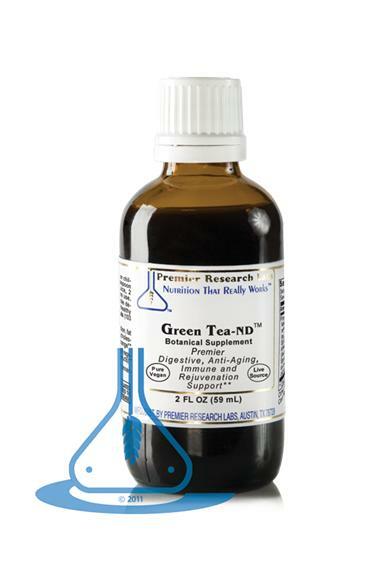 It prevents anti-inflammatory chemicals called “cytokines” from damaging the body. 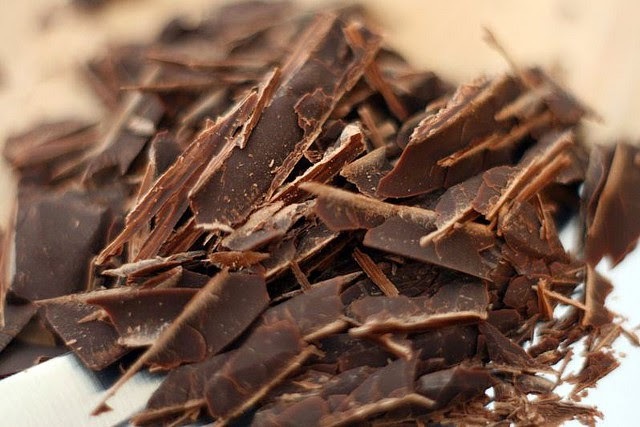 5) High in magnesium Chocolate has been found to be a great source of magnesium. Magnesium promotes muscle relaxation, nerve conduction, energy production and the development of bone and teeth (See white paper for more information). Magnesium is important during a woman’s menstruation. Ladies, stay in tune with your body and you may notice yourself craving chocolate during this time when your hormones are fluctuating. 6) Nutritional powerhouse Cocoa also contains fiber, iron, zinc, copper and calcium. Helping to lower cholesterol levels, fibre promotes low colon cancer rates by fostering sugar metabolism and preventing constipation (See white paper for more information). 7) May promote longevity A French woman that has the longest confirmed lifespan on record lived to be 122 years old. What is particularly interesting about this is that she attributes her long life to eating and applying olive oil to her skin, consuming port wine and eating up to one kilo of chocolate every week. You can read her story here. Before you reach for a chocolate bar, we’d like you to note the difference between varieties. Traditional chocolate bars contain limited cocoa and are filled with sugar, dairy, soy and other ingredients. Dark chocolate is typically made up of only four ingredients; cacao beans, cocoa or coconut butter (fat component) and coconut sugar or maple sugar (sweet component) plus berries or nuts for flavour. It has not been heated above 113°F (or 45°C), so antioxidants, enzymes and nutrients in raw chocolate remain intact during processing. Milk chocolate on the other hand, is typically processed at 266°F (or 130°C). See Food Fight: Dark Chocolate vs. Milk Chocolate If you are looking for high quality chocolate, Zebra Organics offers a great selection of dark chocolate products, including organic and raw chocolate spread by Chocolatl. This is a great addition to any shake or smoothie and makes for a great snack. For many years I worked as a retail associate at various health food stores. This job put me in contact with the public where I would help them choose dietary supplements, herbs and other remedies. Occasionally I was asked whether or not we really need dietary supplements. People want to believe the food we eat gives us the nutrients we need and supplementation is not necessary. If you've ever read the book "Empty Harvest" you know most food is nutrient deficient. But, if you choose organic food you will receive up to ten times the nutrients than conventionally farmed food. While it is possible to get proper nutrition from eating organic food I do think using dietary supplements are important, I will detail 3 reasons why. I am not here to tell you what nutrients you need but I want to illustrate how certain nutrients can benefit your health. optimal, and you are able to detox the aldehydes, you may not suffer any negative effects from exposure. The fact is most soils are lacking in minerals, so would supplementing with molybdenum be helpful? production. So would supplementing with antioxidants or antioxidant rich foods be good for you? EVERY CELL in the body to grow properly). So would supplementing with zinc are eating zinc rich food be good for you? concern, you may consider using supplements for prevention purposes. This topic might not even be a raised, if we lived in a perfect world where the soil is cared for ensuring it is bursting with minerals. But, we don't and we live in world loaded with environmental toxins which inhibit our ability to achieve optimal health. As always the choice is yours in your journey to optimal health. The Latin word for cocoa- theobroma- literally translates to, ‘food of the Gods.’ Cocoa has been used for thousands of years by Central American cultures, primarily as a bitter drink. Mayans used cocoa to create a ritual beverage that was shared during marriage ceremonies. When the beans were exported to Europe by the Spaniards, Europeans sweetened the chocolate and made it into bars. By the late 1700s chocolate shops were common throughout Europe and it became affordable. Today, dark chocolate constitutes a cocoa content of 60 per cent or greater (Learn more at The Centre for Flavonoid Research). Cocoa is a fantastic source of flavonoids, a special class of antioxidant that are responsible from the strong, pungent taste in cocoa. You can read more about this in our post: 7 Reasons Why You Should Eat More Chocolate. Here's the thing: the more the chocolate is processed, the more flavanols are lost. It's important to understand that not all forms of chocolate are rich in flavonoids. Be picky about the type of chocolate that you choose to consume. As a child, you probably ate milk chocolate growing up. It's the sugar in milk chocolate that is well-received by your taste buds. According to the Cleaveland Clinic and many other sources, milk chocolate contains less of the original cocoa bean than dark chocolate does. It’s often diluted with the addition of milk solids, sugar and cream and hence, its nutritional quality is minimal in comparison to dark chocolate. The more cocoa in chocolate, the higher the nutritional quality. Dark chocolate often has less added sugar and fat, which also boosts its overall nutritional value and why it’s more beneficial in moderation. The fat in chocolate comes from cocoa butter, which is made up of 1/3 oleic acid (a heart-healthy mono-saturated fat that is also found in olive oil) and 2/3 stearic and palmitic acids (forms of saturated fat which increase cholesterol and risk of heart disease). The good news is research has shown that stearic acid has a neutral effect on cholesterol, neither raising nor lowering it. Palmitic acid does negatively affect cholesterol levels but it only makes up 1/3 of the fat calories in chocolate. So, don’t feel too guilty in indulging in a small piece of dark chocolate every now and then. Zebra Organics offers a great selection of dark chocolate products, including Anandamine, a blend of unsweetened heirloom cacao and tonic herbs. Anandamine is handcrafted in small batches using organic and wildcrafted ingredients, freshly-ground spices and love. It’s an excellent addition to smoothies, water, tea or cold-pressed coffee. Take 1/2 teaspoon mixed in 1/4 cup water or juice, 2 times daily. For special programs recommended by your practitioner, up to 6 individual servings may be taken daily. Shake gently before use. This formula is preserved with certified organic alcohol with no detectable pesticide and heavy metal residues (via lab testing). * These statements have not been evaluated by the Food and Drug Administration. This product is not intended to diagnose, treat, cure or prevent disease. The Pomegranate fruit has been revered by humans since biblical times. This rich superfruit has mythological and ritual significance and was viewed as a symbol of fertility and abundance. While most fruits and foods have undergone much genetic altering by humans over the centuries the pomegranate is relatively the same now as it was thousands of years ago. The pomegranate is mentioned in the Bible and the Quran, two ancient holy books. It is also a popular fruit in Greek, Roman, Egyptian and Hindu mythology. The associations of Pomegranates with wealth, abundance, prosperity and fertility can easily be transfered to our present day understanding of this fruit as a rich source of polyphenol anti-oxidants. There are few fruits as highly and widely revered as the Pomegranate this makes me wonder if our ancient brothers and sisters know something we are just finding out? While modern research into this fruit is relatively new it does show promise and anecdotal reports from regular Pomegranate juice consumers suggests that it helps with blood pressure, cholesterol, gum strength and the prostate. Pomegranate juice concentrate is easy to incorporate into you lifestyle, my favorite way to use it is to simply add it to a little bubbly water to make a natural soda. Or you can add a tablespoon of the juice concentrate to smoothies, you will be shock by the amazing tastes you can create as it pairs well with many other fruits. Another stellar way to use this juice concentrate is in the morning mixed into yogurt, talk about yum! The sweet and tart flavor of pomegranate mixed with the creaminess of yogurt is heaven. Expand your imagination and see what you can come up with as you explore the complex and delicious taste of Pomegranate Juice Concentrate. including punicalagin and other powerful phytonutrients. This ancient fruit has many modern uses, it is widely popular for good reason; it is super good for you and super tasty. And, by using it in concentrate form you will get a powerful dose of the anti-oxidants in just a tablespoon of juice. 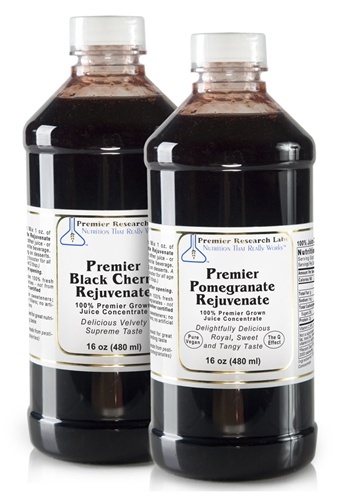 The Premier Research Labs Pomegranate Rejuvenate is made fresh from organically grown pomegranates and nothing else. As you know I am a fan of dark pigment foods simply because they contain tons of anti oxidants. And we don't always need to go for the exotic foreign land foods when we have our own Black Cherry. Our Black Cherry Concentrate from Premier Research Labs also tastes amazing. You have only dreamed of cherries tasting so quintessentially cherry like. Cherries are the signal that the summer stone fruit season has arrived, they herald the arrival more luscious fruits to come and they only last for a little while. Cherries have a short season but Premier Research Labs has managed to captured all the freshness and deliciousness of cherries at their peak to keep you happy no matter what season it is. Historically cherries have been used as a folk remedy for gout, with a deep history dating back hundreds of years. Gout is a painful inflammatory condition caused by the build up of uric acid in the joints. Cherry juice is a popular remedy for this because it can help to clear uric acid from the system. * Cherry juice also contains Anthocyanins and if you follow this blog you will know that these are anti-oxidant pigment compounds found in fruits. These compounds also have anti-inflammatory properties, those helping with minor inflammation. 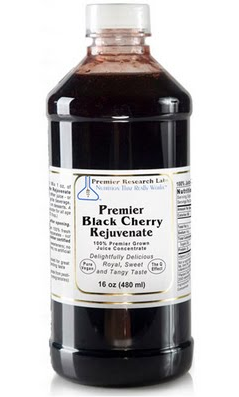 Black Cherry Concentrate from Premier Research Labs is also extremely easy and fun to use, simply add one tablespoon to water and stir. Viola! *These statements are not intended to diganose, treat or cure any disease. What is Maquai Berry Good For? This special little berry from the tip of South America is not a new comer though you may have never heard about. Or maybe you are now just be hearing about it and wondering if the claims add up . . .? 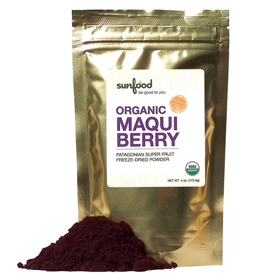 Much like Acai, Maqui is a dark pigment high anti-oxidant superberry from South America. The dark pigments in Maqui are what make it special and what sets it apart from the rest. These dark pigment compounds are known as Anthocyanins, they are found in a variety of fruits from blueberries to grapes to acai and of course Maqui. The difference between Maqui and the others is the sheer quantity of Anthocyanins that it contains. It is simply off the charts when compared to other fruits. So what do the compounds in Maqui actually do for me? Reports claim that the anti-oxidnat compounds in Maqui improve energy levels, skin texture and inflammation response. One thing to keep in mind is all this is subjective but one fact remains, the compounds in Maqui are potent and quite concentrated. So with that in mind lets review the what and why Maqui has received so much positive feedback. Ultra High Levels of Antioxidants: Berries being dark pigmented are known for their high levels of anti-oxidants but in ORAC tests, the tests that measure antioxidant levels, Maqui is far above the rest. Acai has a high score of 185 on the test and Maqui comes in at a whopping 616! This high concentration of anti oxidant potential can be one reason people are feeling so good when they take it. Because most people are getting no where near this level of anti oxidant protection from other foods in their diet. A high level of anti oxidant consumption is known to promote skin health and provide skin sun protection. Pigments: Anthocyanins are flavoniod pigment compounds and flavoniods have been linked to anti-inflammatory activity in the body. Inflammation is as simple as minor aches and pains to major problems like arthritis. Just by simply reducing inflammation in the body we generally feel better because those minor ache are no longer nagging. One way I judge the merits of superfruits is by their coloring because it is a marker signifying their unique properties. And, Maqui has a distinct color signature. After finishing a glass of Maqui mixed with water I filed the glass with more water to get the last of the powder still in the glass. As the water sat for a few minutes it turned a gorgeous lite blue/purple color. Blue is a rare pigment to find in nature and I feel the specialness of Maqui's blue pigment is part of what makes it so great. While I do not believe in magic bullets because there is no such thing as a magic bullet, Maqui does add up in its potential to bring a greater quality of health to those who use it. Like some people you may notice an immediate shift but if you are already healthy you may only notice a minor shift. Maqui is powerful and the power of Maqui may be due to the fact that it is a wild grown and harvested food. Which means its genetics have not been altered by man. Most if not all of the food we consume today has been altered by humans and has been severely domesticated. And Maqui grows in a very wild place Patagonia at the tip of South America. I do feel you can benefit from adding this super berry to your smoothie because anyway you slice it you will only find good stuff and the anecdotal reports seem quite positive for the most part. Some are dramatic and others less so, like anything you need to be consistent when it comes to health. So go ahead and add a spoonful of Maqui to your smoothies and harness some of the wild energy of this berry, its pigments and the vibration of the land where it grows. This tasty berry comes as a freeze dried powder, when you open the package you will be greeted by a deep purple crystal looking powder with a tart aroma. Maqui is available in 4 oz bags for $17.95 includes free shipping. Have you ever eaten a Mulberry? The popular nursery rhyme has made them famous but have you ever eaten a mullberry? Well now you can get a taste of what kids have been singing about for over 150 years. Mullberry fruits are slightly chewy, they have a sweet, mild flavor with a sort of malty fruity taste. Their unique taste must be tried to be fully understood. 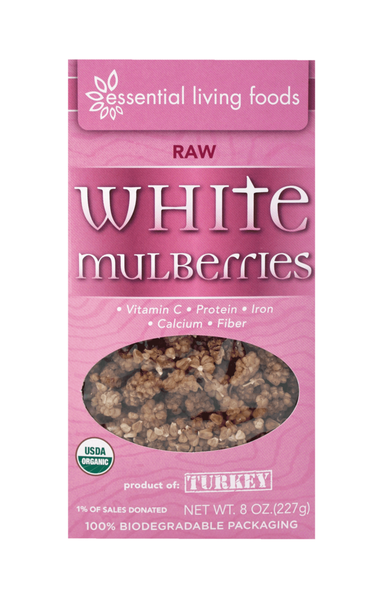 Besides their exquisite taste mullberries add comparable amounts of iron, calcium and vitamin c to the diet. Mullberries are also a good source for reservatrol and anthocyanadins. Reservatrol is a compound most noted for supporting healthy heart function and the anthocyanadins in mulberry fruits are anti-inflammatory. Back to my original question, "Have you ever eaten a mullberry?" Now is the time. Honey is such a special food source and I (Mark D'Aquila) the guy who writes these blogs love it so much. To me honey is magic, what the bees do is alchemy, drinking nectar from a flower then transforming it into a sweet viscous nourishing substance. Honey and bees have been revered throughout time, archaeologists found honey in a pyramid in Egypt and guess what, it is still good, honey never spoils. I call it magic, maybe honey is the real 'fountain of youth'? It does keep the skin moist, supple and dignifies the aging process in that respect. Honey is a high enzyme food, some of the enzymes in honey have been introduced by bees and some are part of the original flower nectar. Heating honey neutralizes the enzymes, to get the enzyme benefits of honey you need to consume it raw. Some of the enzymes in honey include amylase, invertase, the most notable enzyme in honey is glucose oxidase. This enzyme produces hydrogen peroxide which is part of honey's anti bacterial activity and contributes to its wound healing properties. There are literally thousands of honey varieties from all corners of the globe. 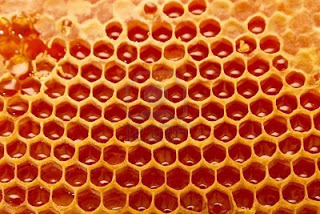 And, all honey varieties are unique because of the flowers and energy of the region where the bees gather the nectar. This expansive variety makes exploring the world of honey a fun, endless and rewarding treat. And I am always looking for a variety or two that truly stand out. Today most honey is produced by apiaries but being that bees are 'wild' animals I wondered if I could find any 'wild' honey. My prayer was answered and not only did I find wild honey but I found wild honey from a sacred source. I am proud that we here at Zebra Organics can now offer you a variety from the sacred Himalayan Mountain range and a variety from virgin forests of central India. From wild beehives in virgin forests, this is certainly something you do not come across very often. This honey is sourced by tribes in central Indian's virgin forests an area far from the pollutants common in more developed areas. These virgin forests are also a source for many herbs used by Ayurveda healing practitioners. From these healing plants within this preserved environment comes this raw wild honey. The tribes who gather this honey are paid a fair price which allows them to maintain a traditional lifestyle and gather honey the way their ancestors have for centuries. Make no mistake there is a lot of care and attention that has gone into this product from the forest itself to the gathering, bottling and shipping. Every effort is made to ensure you receive a truly raw, nutritious and health promoting honey. The unique flowers of this honey provide for a unique variety of anti bacterial, anti viral, anti fungal and anti oxidant compounds. Because normal body processes result in oxidative stress the human body naturally produces anti oxidant compounds. 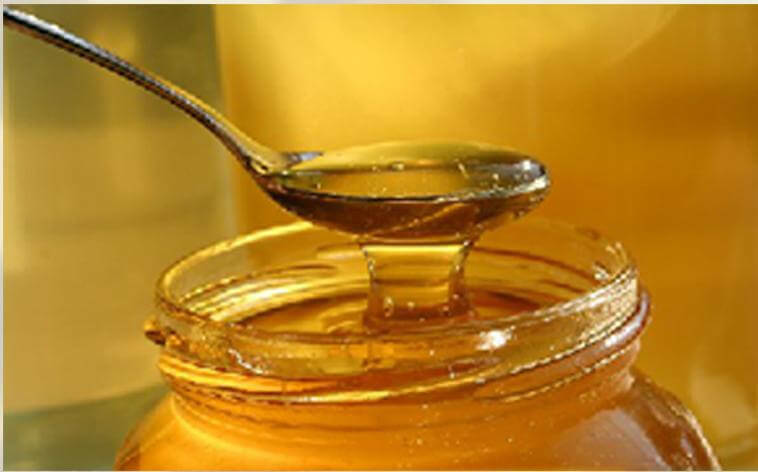 When honey is consumed on a daily basis the levels of anti oxidants in the blood increases. * This is promising because oxidative stress is the body rusting and to slow this process slows the aging process. Honey is a source for bioflavoniods, darker honeys like the wild forest variety contain more bioflavoniods. The Himalayan mountain range has been held as sacred land for thousands of years. It is a place where yogis and mystics live and go to, to attain nirvana, enlightenment. To be able to offer you honey, a sacred food from a sacred mountain is an honor. The White Himalayan Honey we offer is a clear transparent honey sourced from the upper reaches of Kashmir near the border of Tibet. This extremely rare and exotic honey has a rich flavor profile that is almost not noticed at first and then opens up to a world of exquisitely sumptuous subtle flavors. Honey has been and can be used to speed the healing process of wounds. Honey's ability to heal wounds is found its way into the pharmaceutical market, there are now prescription only honey based wound care dressing available. Honey helps wounds heal because of its ability to draw moisture from the wound and the presence of anti bacterial compounds. These are just its natural properties. However you want to look at it honey is truly a special food, whether you want to use it as a sweetener or are looking to it for it potential health benefits, honey can find a place in any pantry. While all honey is unique and special I encourage you to try the wild varieties we offer. By purchasing these wild foods you are supporting the traditional honey foragers in maintaining their indigenous way of life which is in harmony with the environment. *International Symposium on Honey and Health 2008, Sacramento, CA.